KöR Whitening in Sudbury combines in-home and in-office whitening treatments to provide you with a beautiful, brilliantly white smile. 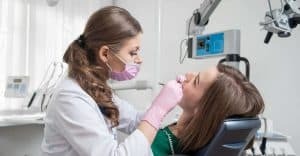 At Sudbury Dental Excellence we offer both the KöR MAX and KöR ULTRA whitening systems; which are one of the most popular and most effective teeth whitening solutions currently available. KöR solutions offer cost-effective treatments without lights or lasers. These proven systems deliver phenomenal results thanks to the proprietary Dual-Activated, Tri-Barrel Hydremide Peroxide formulation and delivery system. The high-potency gels are continuously refrigerated from time of manufacture to the time of use to prevent any chemical degrading; this means you will receive consistent and amazing results. Your whitening journey will begin with a consultation with our dentist, Dr. Alvi. Dr. Alvi will examine your teeth’s condition and evaluate how much discoloration and staining currently exists. Together, you will discuss your concerns and desired results. She will then present various whitening options and go over what you can expect with each one as well as answer any questions you may have. You can then choose the whitening treatment that will best fit your needs while producing the results you are looking for. The KöR MAX program is perfect for most patients with average staining or discoloration; while the KöR Ultra program is made for those with more stubborn cases of staining and discoloration. Even if whitening treatments have failed you before, KöR is likely to provide more effective and longer lasting results than you ever thought possible. Upon selecting KöR MAX or KöR ULTRA we start by taking impressions of your teeth. We send your impressions to the KöR lab in California. There, the lab specialists fabricate custom KöR-Seal Trays for you. These trays have been scientifically designed to lock in the whitening gel. Once you receive your KöR-Seal Trays you can begin your system’s specific protocol as outlined below. KöR MAX: The most popular choice and provides exceptional results for most patients. Treatment consists of two weeks of at-home nighttime whitening, followed by one in-office whitening treatment. For extra-long lasting results we recommend continuing periodic at-home maintenance treatments. Treatment consists of two weeks of at-home nighttime whitening, followed by one in-office whitening treatment. For extra-long lasting results we recommend continuing periodic at-home maintenance treatments. KöR ULTRA: Designed for more difficult cases of teeth discoloration and staining. Treatment begins with an in-office conditioning treatment followed by three to four weeks of at-home whitening at night. After, you will come in for a final in-office whitening treatment. For extra-long lasting results we recommend continuing periodic at-home maintenance treatments. You will love how bright your smile is after one of our KöR Whitening Treatments. Schedule a consultation today!